We haven't spent a Valentine's Day weekend at home since we started dating. Instead February 14th has always included some sort of baked treat and outdoor activity. This year, we're changing things up. Our weekend will be filled with copious amounts of basketball, hanging with friends visiting from out of town and these cookies -- currently stashed at the back of our freezer for safe keeping. Red Velvet is no stranger to this blog, or my kitchen, and seemed fitting for this time of year. I was determined to make a naturally dyed version, and with a little help from Food52 and Joy the Baker, I unlocked the secrets behind naturally dyed red velvet. 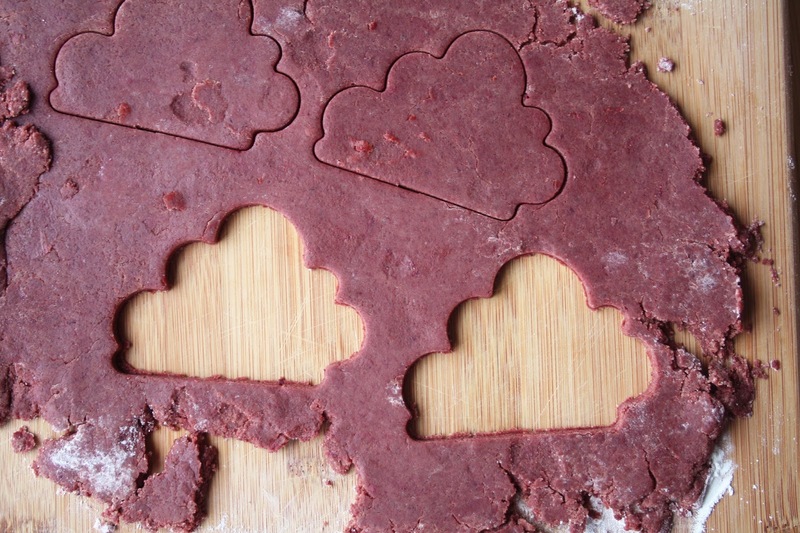 As for the clouds, well, who really needs a heart shaped treat when they can have a red cloud instead?! Happy love day friends! PS. If you haven't already, please do hop over to my new Etsy page for a quick look -- more listings to come in the next few months. These cookies are reminiscent of classic shortbread, jazzed up with a subtle chocolate flavour and vibrant red colour. 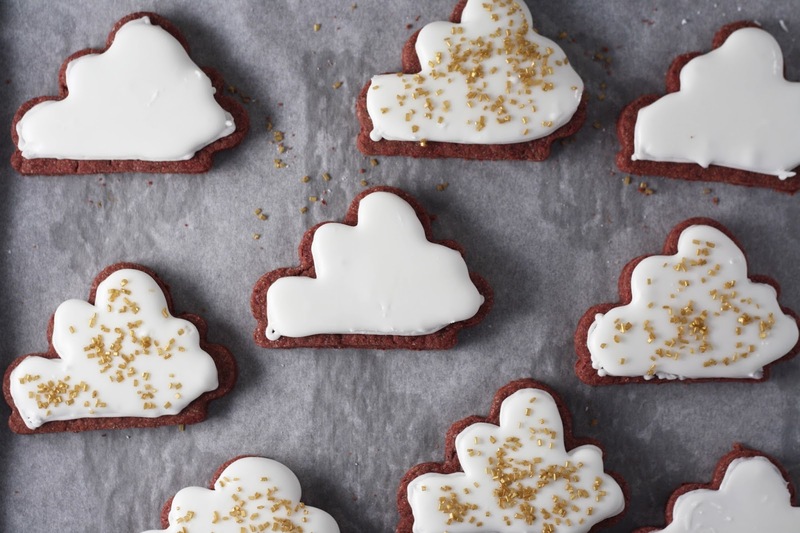 If you're up for the challenge, the royal icing makes for a fun addition. 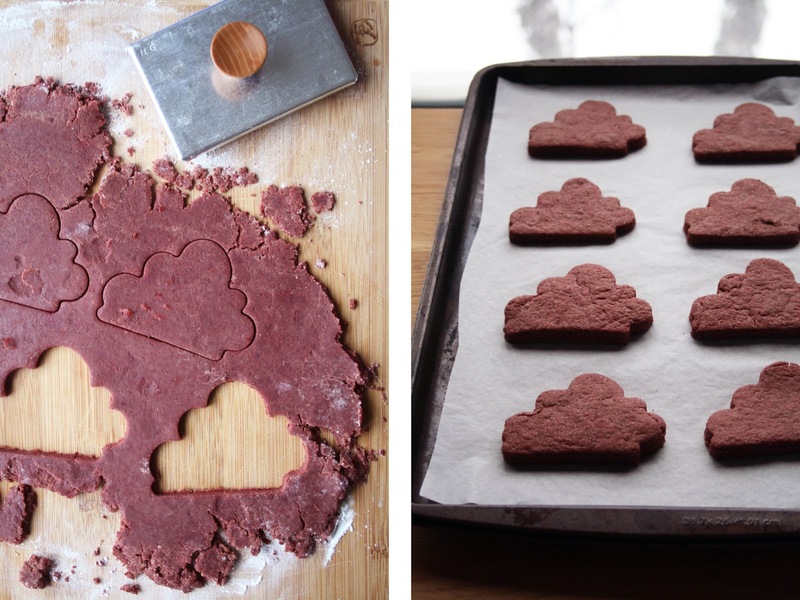 Cloud cookie cutter from Herriott Grace. Make the beet dye (purée). 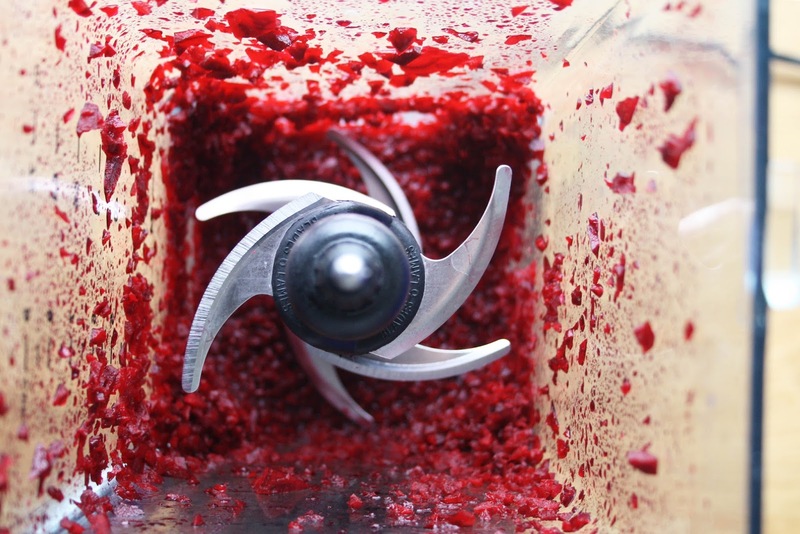 Combine the chopped beet and 1 T water in a small blender (magic bullet). Add a bit more water if needed to get the blade whizzing. Blend until a purée forms (don't worry if it's not super smooth). Set aside. In a food processor fitted with the s-blade, combine the flour, sugar and cocoa powder. Pulse a few times until incorporated. 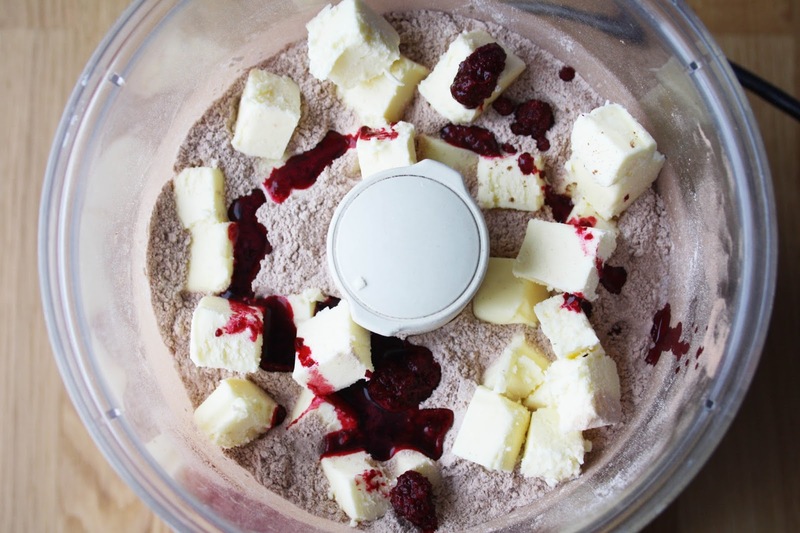 Add the cubed butter and 3-4 T liquid beet dye (use as much of the liquid that has formed in the blender, then supplement with the purée). Pulse to a crumb. Assess the colour, and add more beet dye if need be. Continue to run the food processor until dough comes together. Add 1-2 T water if dough seems too dry - you want it to stick together when pinched. Turn out the dough onto a well-floured surface. Roll to about 1/4inch thick and cut into desired shapes. Transfer to the prepared baking sheet. Bake for ~15 minutes, until bottoms are lightly browned. Remove from the oven and set aside to cool on a wire rack. For the royal icing, combine the egg white, lemon juice and sugar in a stand mixer fitted with the whisk. Whip until stiff peaks form. If it looks too thick, add a drop of water - this will make piping easier. Make sure cookies are completely cool. Apply icing as you wish. This video was super helpful!